We sing hymns to this time of year, the autumn, when you hear the faint honking of a high school marching band’s tuba during a dog walk, when you hear the bass drum getting ready for football season, when the suffocating heat flirtatiously hints at departure, when talk turns to starting quarterback position battles and back to school strategies. These narratives — not quite to the point of picking out Halloween costumes — replace the spring and summer stories about gardens and swimming pools and a particularly great set of tropes about one of our favorite subjects here at Midtown Montgomery Living: baseball. The March and April odes to rebirth and green grass, when all the teams are in first place — those are well-worn and clichéd. The true fans of baseball know that the season is incredibly long, requiring endurance, adaptation to injuries, and a lot of brutal summer heat. College baseball ends in June. People never stop thinking about football. But let’s not give up on the baseball diamond just yet. You may be willing to tune into the playoffs of the major leagues, wondering about the World Series in October. But have you forgotten the joys of August and September minor league baseball? There are five Montgomery Biscuits games remaining at home, a series against the Tennessee Smokies, September 1-5. As of this writing, the Biscuits are now behind the Jackson Generals by a game-and-a-half in the division, and the Chattanooga Lookouts by a game in the Wild Card standings with nine games to play. But that will all change, with various wins and losses. Bonus baseball and league championships are fun, but not crucial. 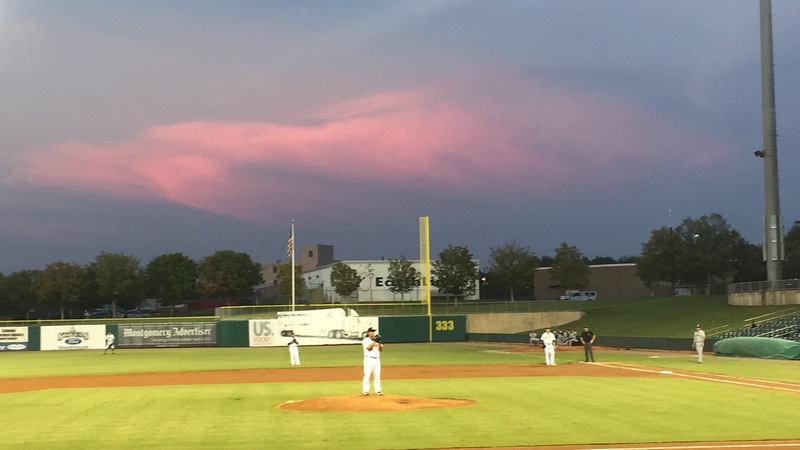 The postseason is fun, but isn’t really the main reason why minor league baseball is amazing. It’s fun to check in on how the team has evolved and grown since the spring. Some players have been called up, now playing in Durham, or perhaps Tampa. It’s fun to go to the game when the fans aren’t there for fireworks or themed promotional nights. The youth league baseball teams aren’t there filling the seats to learn some of the finer points of the game. It’s really just pure and simple baseball, something we are constantly reminded that our city is lucky to have. In these end-of-the-season games, whether the Biscuits are in competition or not, it’s important for us to continue to support the team — to put our dollars behind the important point that we’re not just a football state, that a couple of hours of baseball and ballpark food are a great value for your entertainment dollar. We went to a game last week and had a great time. The weather was mild, the veggie burgers were quickly-prepared, the beer was cold, and the Biscuits won. Starting pitcher Chih-Wei Hu looked really solid, and is only 22 years old. The Biscuits return to Montgomery on Sept. 1 to open a homestand against Tennessee. That game will be the last “Thirsty Thursday” of the 2016 season, and is also “Alabama/Auburn Night.” Tickets can be acquired here.